This short tale combines two holiday traditions, Halloween and Christmas. Two young ghost siblings named Emma and Andrew are upset that Santa failed to visit them with Christmas gifts last year. They are decorating their haunted house for Christmas and writing their Christmas lists in the hope that Santa won't ignore them this year. But the weather is bad, the GPS is out and Rudoph is on strike. Jack the Elf has a solution; he will enlist Clara, the Christmas witch, to use her high speed broom to deliver the presents. 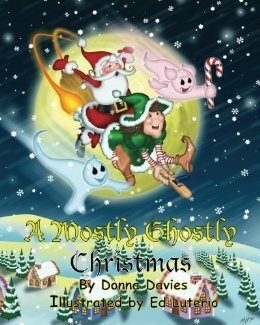 Will he convince Santa to make the trip and avoid disappointing our ghostly friends?This book does tell an innovative Christmas story. The verse is fairly simple, though the story line is a bit far-fetched. Luterio does an excellent job with the illustrations by creating charming facial expressions and large, brightly colored images. Young children will enjoy simply thumbing through the pictures to visualize the story. I won this book through First Reads. Very cool book - connecting Halloween and Christmas. My son loved it & insists that we read it every day up until Christmas. (: Can't wait to read more from this author! Cute story. My grandchildren enjoyed it also.